I am fairly certain this is my favorite time of the year. 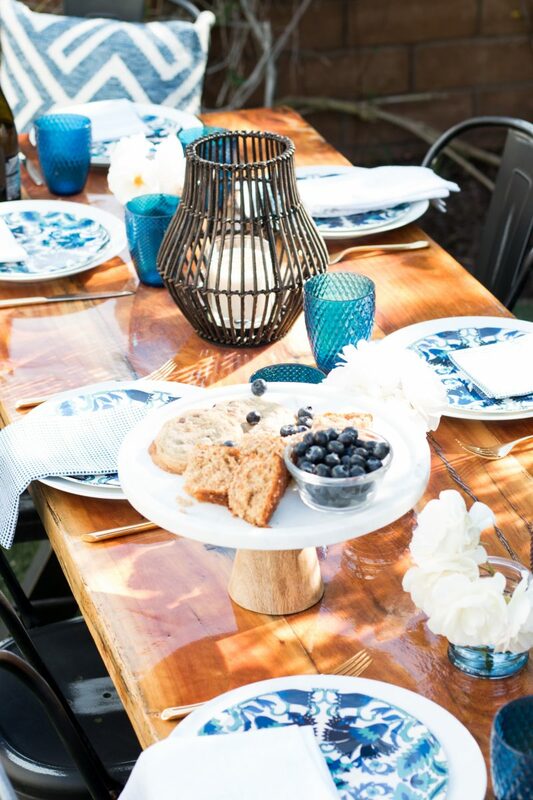 This is something so invigorating about the sun shining and being able to gather together with friends and family outdoors. 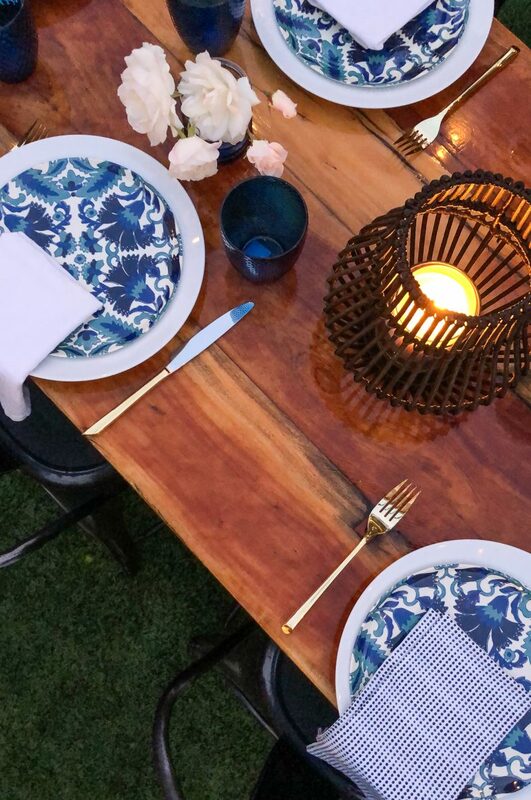 Most of the time we keep things super casual outdoors and don’t even set a table. 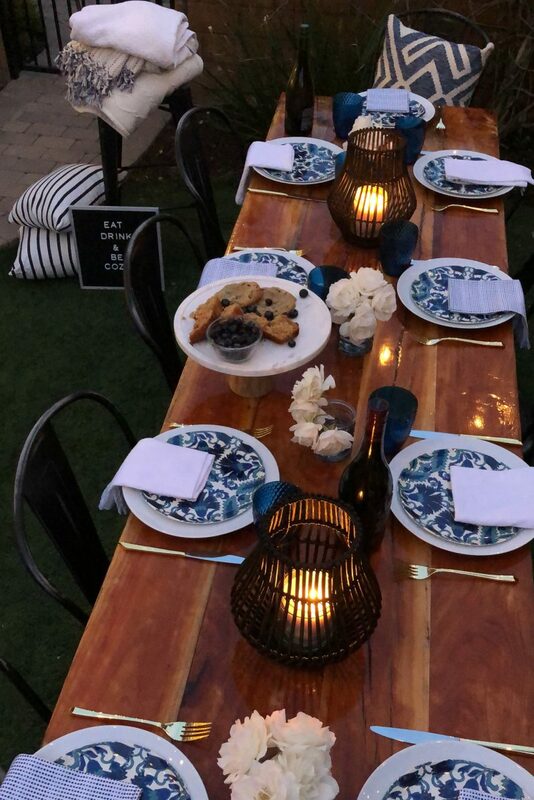 But if we are hosting a special dinner and want to create a cozy vibe, I try to keep it simple but inviting. 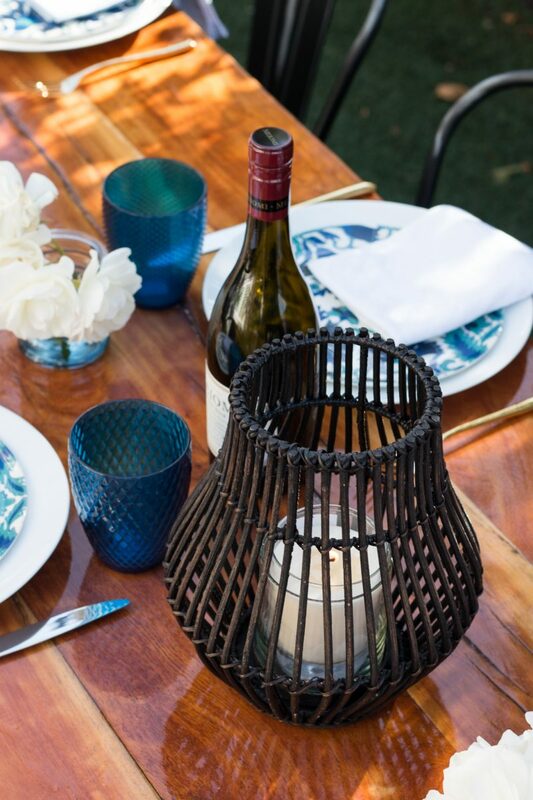 Today I am happy to be partnering with World Market to bring you my best tips for outdoor entertaining made easy. If you don’t already have a set of white dishes, I recommend investing in one. I have these. They didn’t break the bank and they have held up really well. 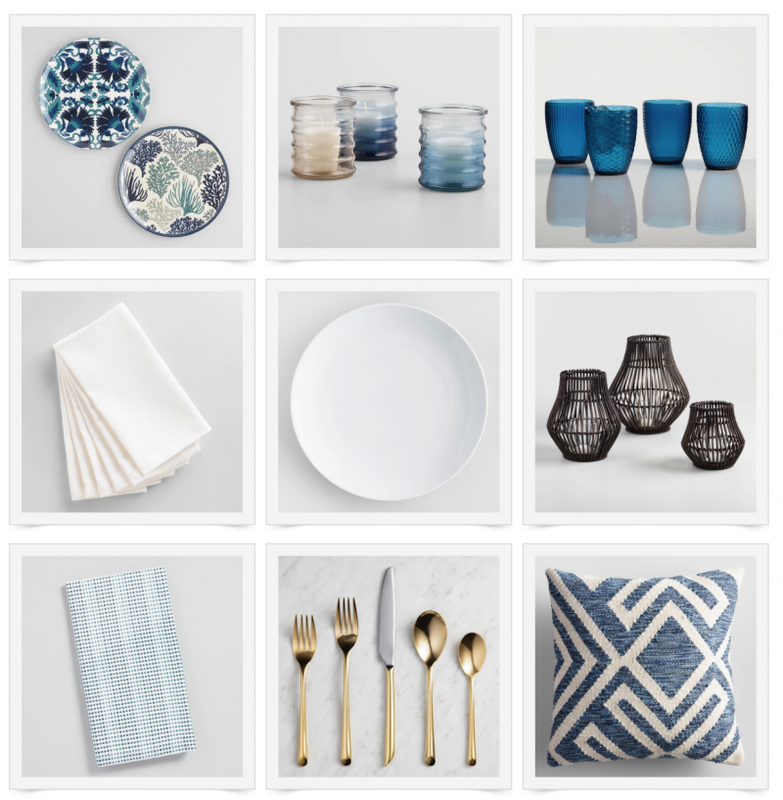 I always like to bring white linens and dishes to the table and then go from there. It keeps the table looking clean and crisp. I do the very same thing when I set our dining room table for different holidays or events. Now it’s time to add in all of the fun color and pattern. 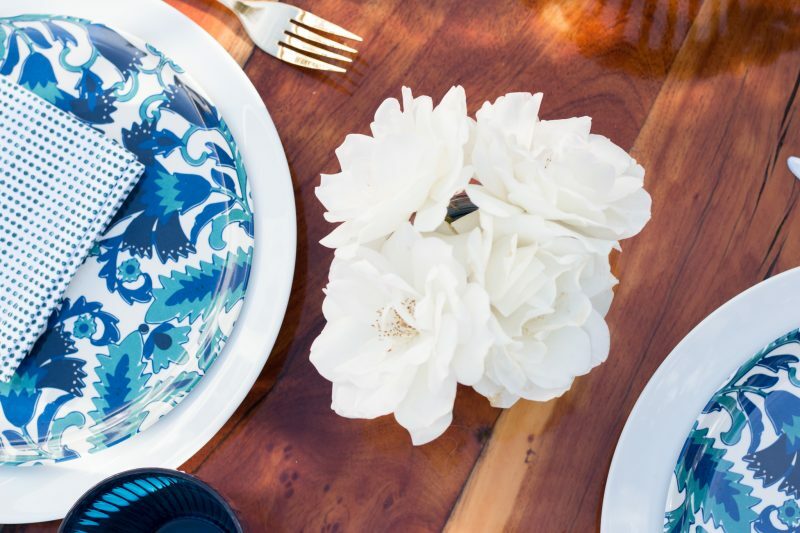 Accent dishes and napkins are perfect for this. 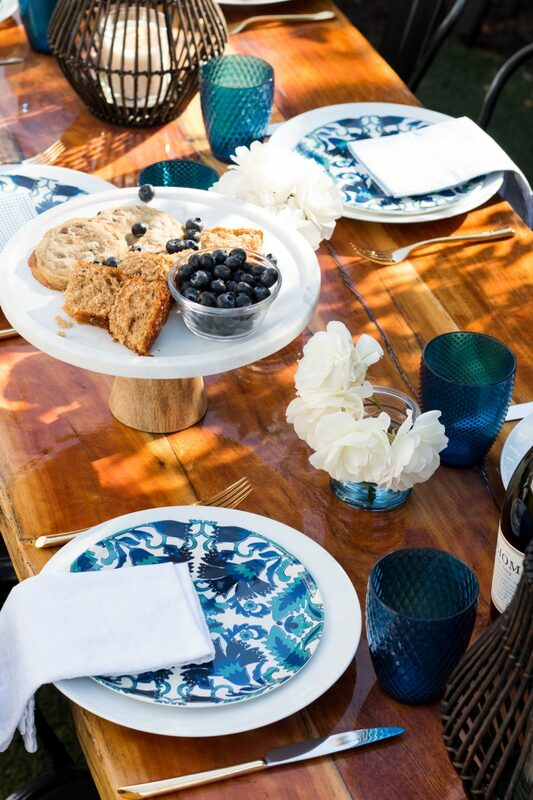 The acrylic patterned dishes are an easy way to add a real dose of energy. I fell in love with this color combination. Plus you can see this table from inside our great room so using the blue ties in nicely for us. Don’t be afraid to mix patterns as long as they are different scales. The small polka dots work because they are resting on a large pattern. This rule works for pillows in your home, too! The acrylic glasses come in a set of four different textures and they add so much to the table. I love the varying patterns. It’s little things like that which create a more interesting result. I also like the size. They work for serving water or wine so they are really versatile. They also nest for storage which is key! When I host 10 people, I often combine my sets of napkins. I do have a set of 12 white napkins but here I used five and mixed in five of the polka dot. This keeps your cost down when buying those fun accent sets. You don’t always need a full set. 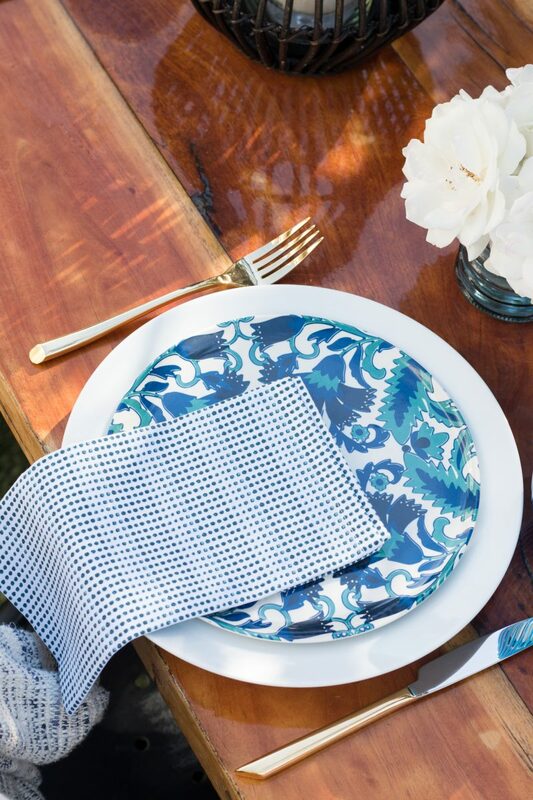 The mixing of the colors and patterns makes the table more charming and casual. Whenever I can, I like to use the flowers or greens from our yard. These pretty glass votives are perfect for keeping the flowers low. There is nothing worse than trying to see people over a huge floral arrangement. In a setting like this, you want people to have a clear view of everyone at the table. Not to mention it’s far less expensive. If you don’t have flowers in the yard, one or two bunches from the store will be more than enough to fill your votives. Lighting is key!!!! It’s on thing if you are entertaining during the day, but at night you need the ambiance. Not to mention you need to see what you are eating. 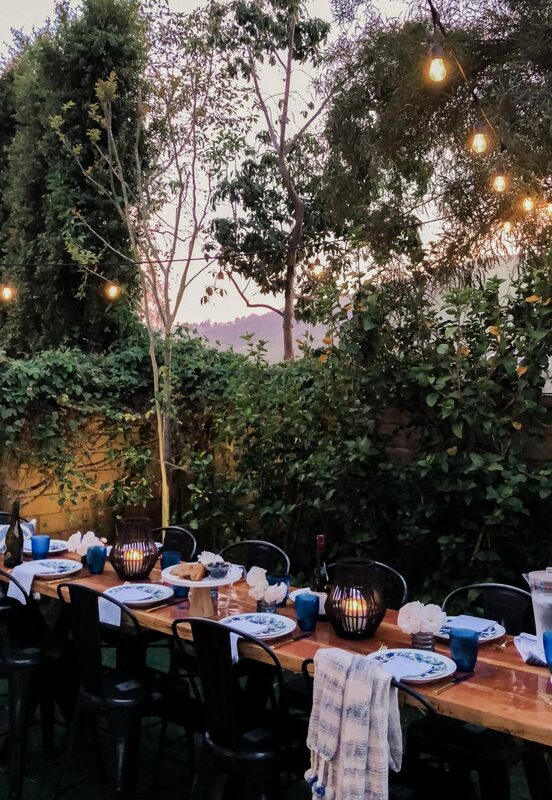 We have outdoor lights strung above this table which adds a bit of charm. But I really like the texture of these hurricanes. They add a rustic, outdoor element and I set my own jar candles inside. Just be sure to use unscented. There is nothing worse than having a perfumed candle wafting in a guest’s face all night. Been there. 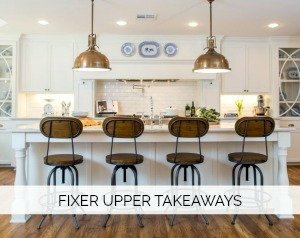 The gold flatware adds that bit of shimmer that every table needs. It keeps it from reading too dull and the lights reflect off of it so nicely. Last but not least, if you are entertaining outside, it’s so important to consider the temperature and what the weather will be. While our days are warm, our nights are always really chilly. So be sure your guests (especially the women) have blankets readily available. I have yet to see one of the husbands reach for a throw! I want people to feel at home and that they can really relax. 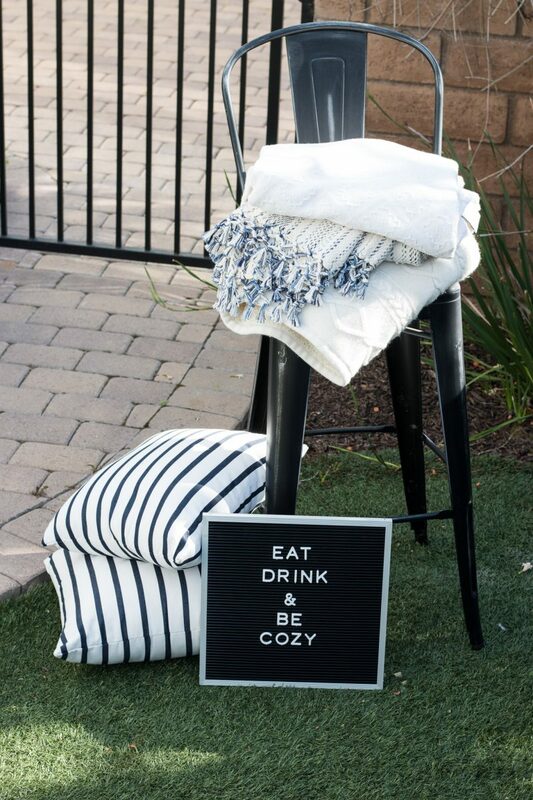 Keep your guest cozy and comfy and the night should be a success. Nothing better than gathering with people you love. If you are looking for an easy recipe that everyone loves, this works so well for a dinner like this. Also a big fan of potluck dinners so it keeps it even easier. So many of you have asked about our table. This was a lucky find. My dream was to have a table long enough to fit our entire family or host a few couples at once. When we first moved into our home I was at a nearby fabric workroom and they were moving. This was the table they had in the middle of their space to meet with client. We just happened to be in the right place at the right time. My husband treated it with a glaze that protects it from UV rays and water. While it may not last us a lifetime, we plan to enjoy it as long as we can. 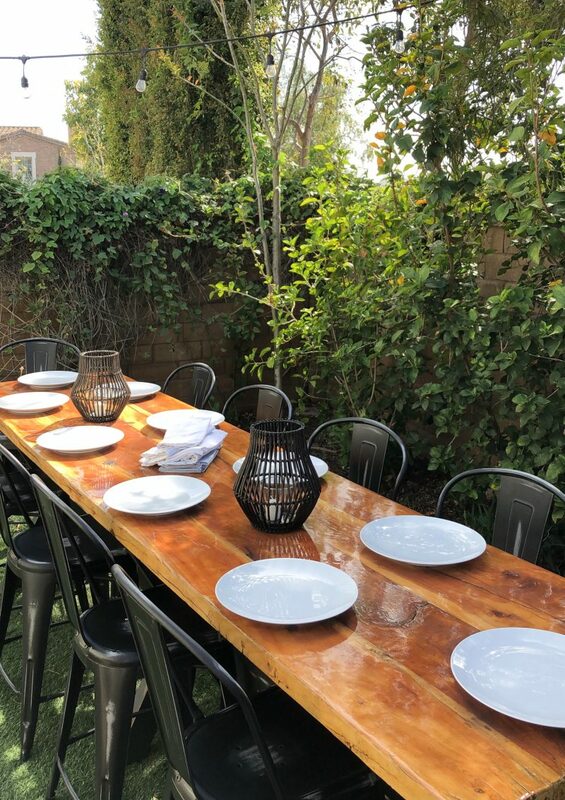 We do plan to add another table to a covered area of our yard and I am looking at this one. I just saw it in store and love the style. Just a heads up that the pillows shown above are indoor/outdoor but AMAZING. I would 100% use them inside. In fact I am considering adding them to our loft space. They are really a great find. 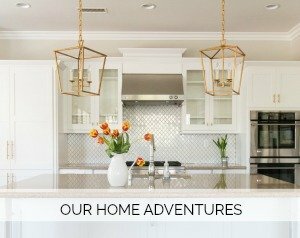 I hope these tips encourage you to open up your home and enjoy a night with friends. Simple but pulled together keeps it feeling relaxed for everyone. What’s on your agenda today? I skipped my workout yesterday so it’s off to workout for me. Then it’s time to catch up on laundry and finishing painting the pantry. Hoping for a very productive day. Thanks for stopping by. 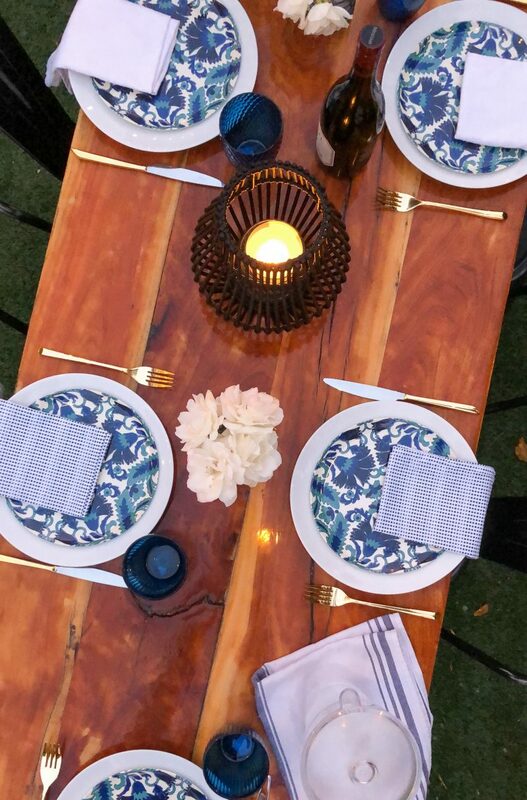 I love your outdoor table! What type of finish did you use? It is beautiful! Do the blue cups nest for storage? If so, I need them : ) Thanks for the morning inspiration. Your table is so pretty Courtney! The table itself and your table setting. Love the blue and white. You have a beautiful backyard and I bet it looks magical at night with your string lights and lighting on the table. 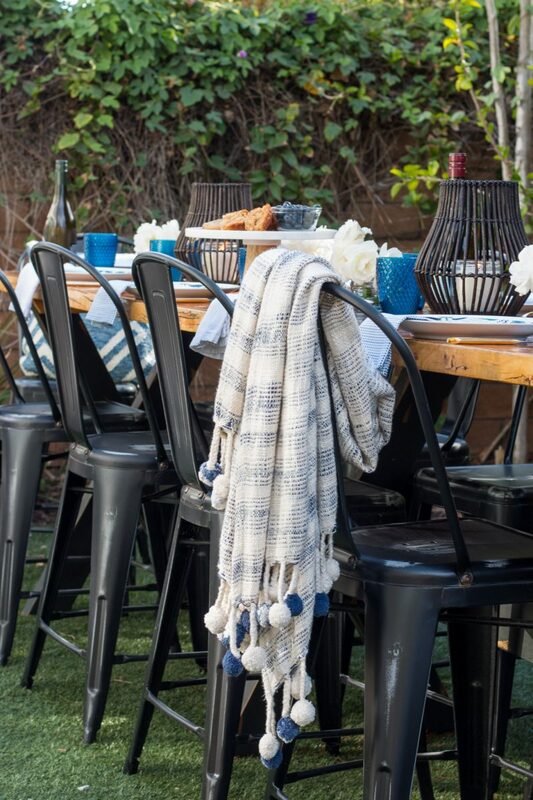 We eat outside any chance we can get and also enjoy entertaining outside. Thank you for sharing your lovely table with us! What a lovely space you have! Such a warm and inviting backyard you have set up. Will we ever get to see the backyard as a whole? We have gotten little peeks here and there but I would love to see more shots of the whole layout! How do you deal with bugs, especially big nasty moths, during the evening outside? Good question. Southern CA doesn’t have as many bugs during the summer. This time of year we don’t have a problem. As it gets much warmer, we start to get mosquitoes and I am big on having rosemary around. They don’t like it! I seem to be the only one in our family that gets bothered by them so I be sure to cover with a blanket, too. But in general, we are super lucky with being able to sit outside most of the time.